DALLAS — When Dallas goaltender Kari Lehtonen had to face Pittsburgh's top three scorers in a shootout Friday night, he relied on a memory going back all the way to the first period. "I tried to use the Hagelin goal kind of as a reminder," Lehtonen said. "I'm sure they were looking at that too, thinking of shooting and that's a way to score, so I decided to stay a little bit more out and be patient rather than have a lot of flow backwards like I usually do." The approach worked. Evgeni Malkin, Sidney Crosby and Phil Kessel, with 71 goals between them this season, failed to score. Lehtonen saved Kessel's shot on Pittsburgh's last chance. Malkin shot wide left, and Crosby sent the puck off and over the crossbar. "I wasn't that close to Crosby's shot," Lehtonen said. "Luckily, he missed the net." Lehtonen earned his fifth straight win, and Dallas also stretched its win streak to five games. Shooting second, Seguin sent a shot off Matt Murray's right side and into the net. Dallas remained fourth in the Central Division, but pulled within three points of co-leaders Nashville and Winnipeg. Pittsburgh fell five points behind Metropolitan Division-leading Washington. The Penguins tied it with 1:13 left in regulation on defenceman Justin Schultz's goal from above the left faceoff circle. Murray had been replaced by a sixth skater. "It was a big point," Schultz said. "We would have liked two, but that's a good team over there." Pittsburgh took a 2-0 lead in the first period on goals by Riley Sheahan and Hagelin. The Stars' comeback began when Seguin scored his sixth goal in five games at 17:57 of the first period. John Klingberg and Dan Hamhuis scored early in the third period to give Dallas a 3-2 lead. It was the first win for the Stars when trailing after two periods, and the first loss for Pittsburgh when leading entering the third. "We're usually a good third-period team," Murray said. "It's unfortunate that a game like that has to go to a shootout, but we played really well." Lehtonen finished with a season-high 34 saves. After the Stars missed the playoffs last season, they acquired goaltender Ben Bishop, who has played in more than two-thirds of their games. 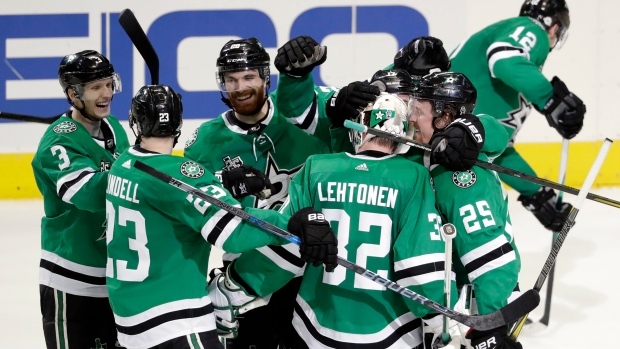 "I think they're quite frankly one of the big stories of the team," Stars coach Ken Hitchcock said. "Your goalie is gonna have to be the best player on the road and he has to win games for you if you're gonna be a playoff team." Murray made 33 saves, including stops on breakaways by Jamie Benn and Alexander Radulov in overtime. Benn assisted on all three goals for Dallas. Sheahan scored at 9:07 of the first period. He beat Dallas' Jason Spezza to a loose puck, skated down the left side and slid a backhand between Lehtonen's legs. Dallas had a power play when Hagelin took the puck for a breakaway. Klingberg tried to reach out to slow Hagelin with his stick, but Hagelin beat Lehtonen anyway at 10:54. NOTES: Pittsburgh C Zach Aston-Reese assisted on Sheahan's goal for his first point in his third NHL game. ... Stars rookie D Dillon Heatherington also had first NHL point in his fifth game, assisting on Seguin's goal. ... Penguins D Jamie Oleksiak played against his former team for the first time since Dallas traded him in December. ... Stars C Martin Hanzal missed his 21st game this season after being hit in the left leg by a teammate's shot during Thursday's game at Chicago. ... LW Conor Sheary returned to Pittsburgh's lineup after missing three games. Penguins: Complete a two-game trip Sunday at St. Louis. Stars: Host Vancouver on Sunday.